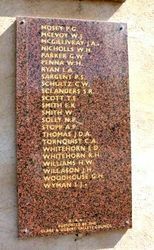 A monument commemorates those who served in the 9th Light Horse Regiment in World War One. The monument is a glass-fronted edifice containing a restored War Trophy German World War One Krupp 75mm Field Gun that was captured by the 9th Australian Light Horse on the 8th August 1918. Within the confines of the enclosure are descriptions and accoutrements of the Ninth Australian Light Horse. On two of the glass panels are acid etched effigies of the 9th Light Horse badge. On each of the front walls are two polished granite plaques, all details are in gold leaf. It was built with volunteer labour under the direction of the Clare and District Light Horse Memorial Project Committee. The 9th Light Horse Regiment was a mounted infantry regiment of the Australian Army during World War One. Approximately three-quarters of the regiment hailed from South Australia and the other quarter from Victoria. The regiment was raised in October 1914, and assigned to the 3rd Light Horse Brigade. During the war the regiment fought against the forces of the Ottoman Empire, in Egypt, at Gallipoli, on the Sinai Peninsula, and in Palestine and Jordan. After the armistice the regiment eventually returned to Australia in March 1919. 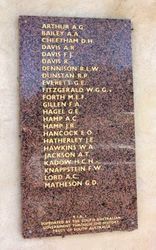 For its role in the war the regiment was awarded fifteen battle honours.